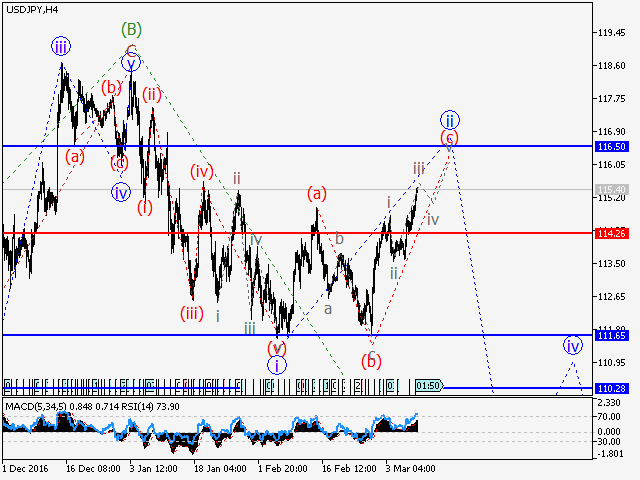 Wave analysis and forecast for 10.03 – 17.03: It is expected that the upward correction will soon complete. Estimated pivot point is at the level of 1.3600. Analysis: Presumably, the formation of the wave C of the senior level continues. Locally it is likely that the upward correction, as the wave ii of C, is nearing completion. Within this wave a zigzag (a)(b)(c) is being formed with the extending wave (c). If this assumption is correct, the pair can decline to 1.3300 – 1.3240. Critical level for this scenario is 1.3600. Alternative scenario: Breakout and consolidation of the price above the level of 1.3600 will trigger further rise in the pair up to 1.3700. Our opinion: Sell the pair below the level of 1.3600 with the target of 1.3300 – 1.3240. 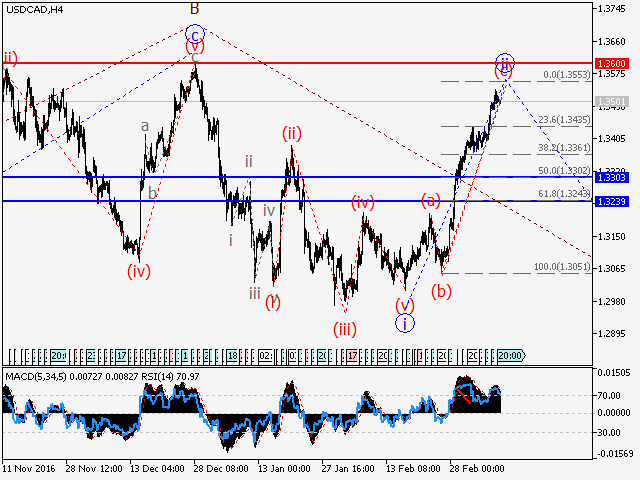 Wave analysis and forecast for 10.03 – 17.03: Upward correction continues. Estimated pivot point is at the level of 114.26. Analysis: Presumably, the formation of the wave (С) of the senior level continues. Locally, it is likely that the formation of the upward correction as the second wave continues, within which the wave (c) of ii is being formed. If this assumption is correct, the pair may continue to rise up to 116.50. Critical level for this scenario is 114.26. Alternative scenario: Breakout and consolidation of the price below the level of 114.26 will trigger further decline to 111.65. Our opinion: Buy the pair from correction above the level of 114.26 with the target of 116.50. 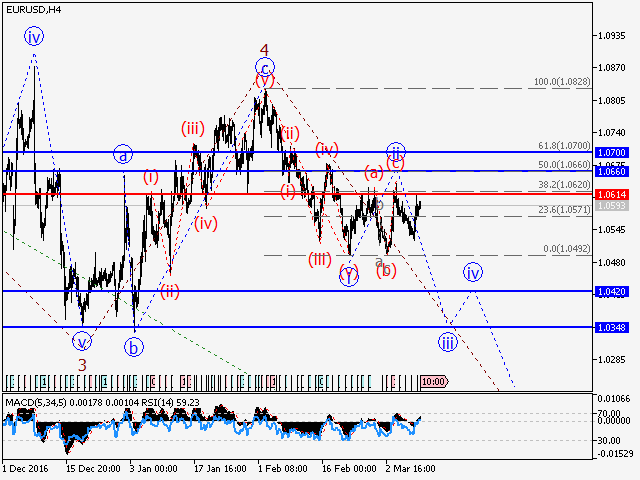 Wave analysis and forecast for 10.03 – 17.03: The pair is undergoing correction. The decline is likely to continue. Estimated pivot point is at the level of 1.0157. Analysis: Presumably, the formation of the first wave I within the third wave of the senior level continues. Locally, it is likely that the downward correction ii of 3 is being developed within which a wave (a) is being formed. If this assumption is correct, the decline in the pair can continue to 1.0050 – 1.0014. Critical level for this scenario is 1.0157. Alternative scenario: Breakout and consolidation of the price above the level of 1.0157 will trigger the rise in the pair to 1.0220 – 1.0280. 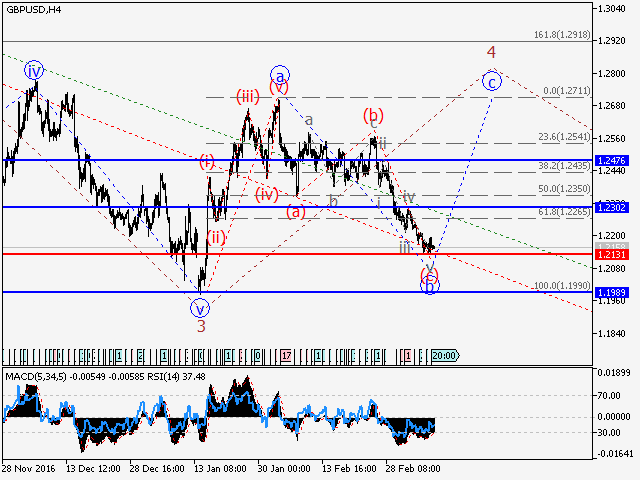 Our opinion: Sell the pair from correction below the level of 1.0157 with the target of 1.0050 – 1.0014. 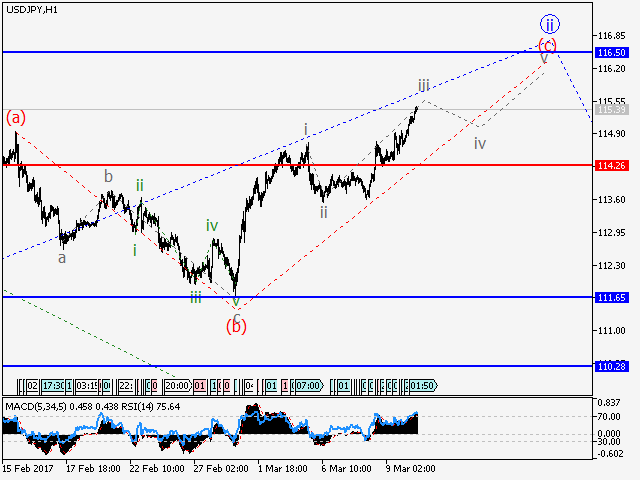 Wave analysis and forecast for 10.03 – 17.03: The pair is likely to rise. Estimated pivot point is at the level of 1.2131. Analysis: Presumably, the formation of the upward correction as the wave 4 of the senior level continues. Locally, it seems that the wave (c) of b of 4 has completed. If this assumption is correct, the pair may resume growth up to 1.2300 – 1.2476. Critical level for this scenario is 1.2131. Breakdown of this level may trigger further decline in the pair up to 1.1989. Alternative scenario: Breakout and consolidation of the price below the level of 1.2131 will trigger further decline in the pair to 1.1989. Our opinion: Sell the pair from correction above the level of 1.2131 with the target of 1.2300 – 1.2476. 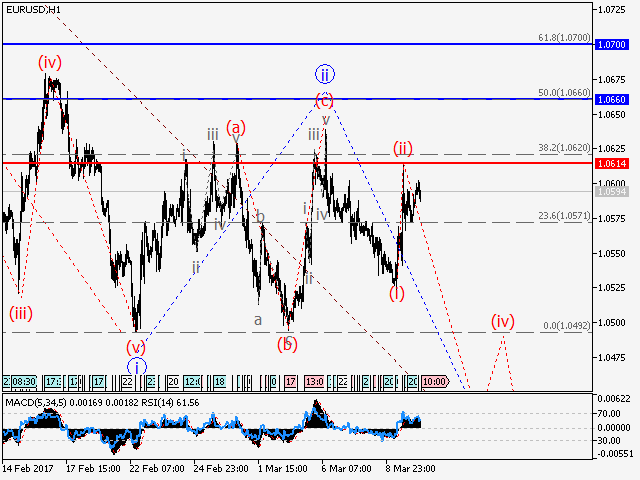 Wave analysis and forecast for 10.03 – 17.03: The pair is likely to decline. Estimated pivot point is at the level of 1.0614. 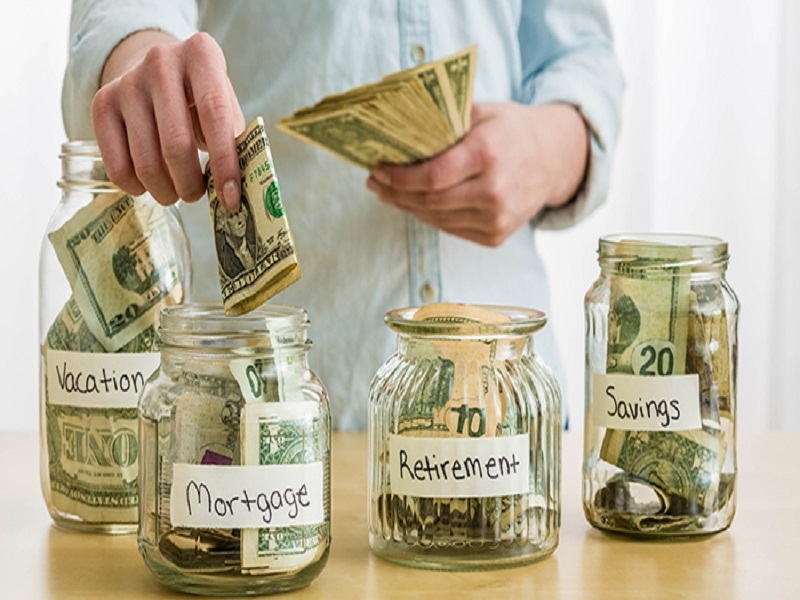 Analysis: Presumably, the formation of the fifth wave 5 of the senior level continues, within which the third wave iii of 5 is being developed. Locally, it seems that the upward correction as the wave (ii) of iii is completed. If this assumption is correct, the pair may continue to decline to 1.0420 – 1.0350. Critical level for this scenario is 1.0614. Alternative scenario: Breakout and consolidation of the price above the level of 1.0614 may trigger further rise in the pair up to 1.0660 – 1.0700. 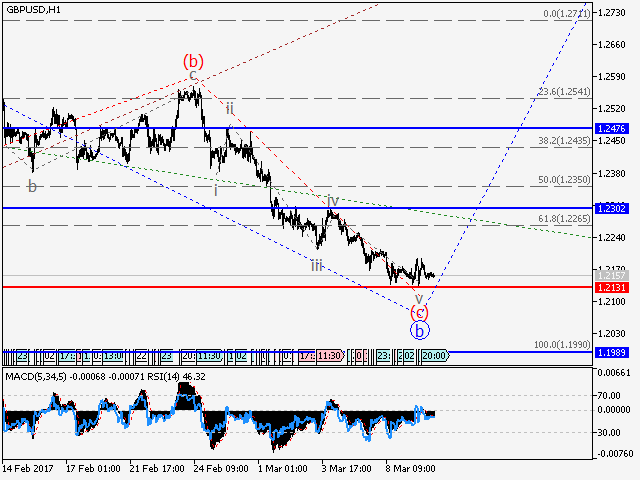 Our opinion: Sell the pair from correction below the level of 1.0614 with the target of 1.0420. Our preference: short positions below 18.4000 with targets at 18.2000 & 18.1200 in extension. Alternative scenario: above 18.4000 look for further upside with 18.4800 & 18.5500 as targets. Our preference: short positions below 1248.80 with targets at 1240.75 & 1235.50 in extension. Alternative scenario: above 1248.80 look for further upside with 1252.00 & 1258.50 as targets. 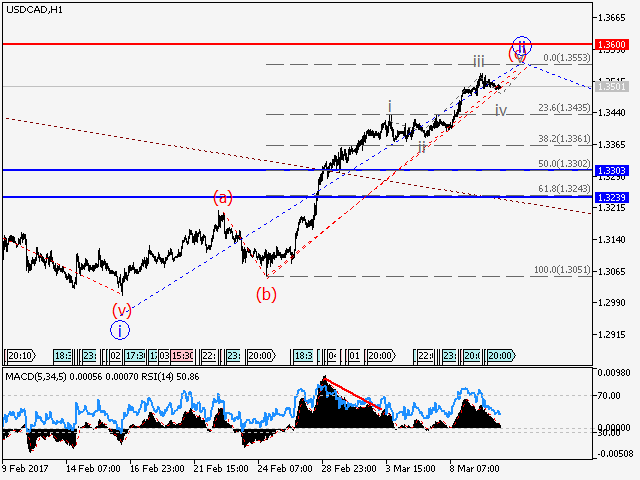 Our preference: long positions above 0.8505 with targets at 0.8555 & 0.8580 in extension. 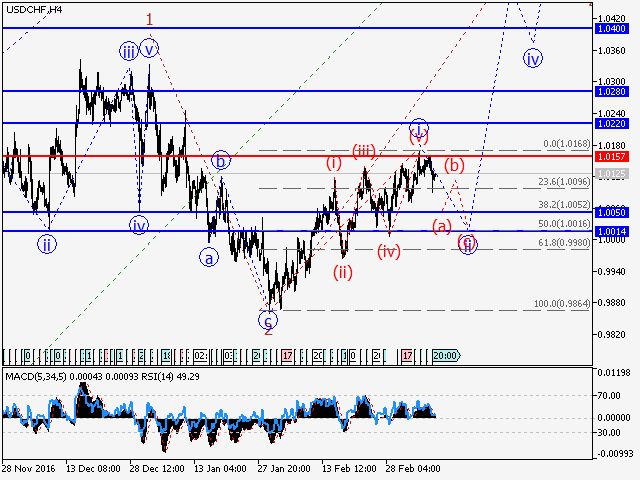 Alternative scenario: below 0.8505 look for further downside with 0.8470 & 0.8435 as targets. Our preference: long positions above 1.3230 with targets at 1.3355 & 1.3380 in extension. 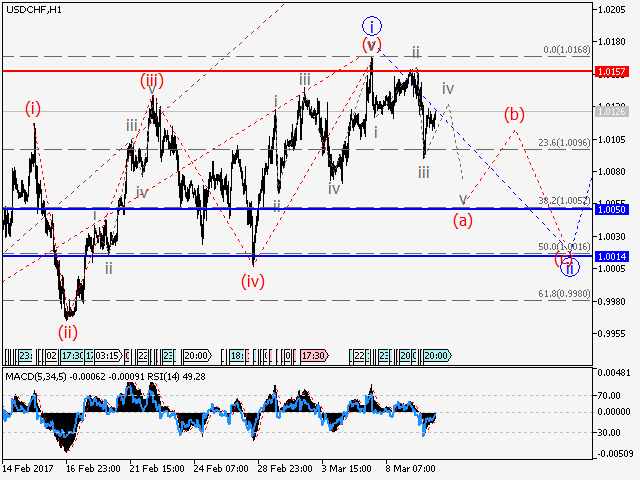 Alternative scenario: below 1.3230 look for further downside with 1.3195 & 1.3165 as targets.